I love it when my clients tell me that they or someone close to them lives on a beautiful property overlooking the Santa Monica mountains, or they have 360 degree views of the ocean, or they have a ton of acres of beautiful untouched ranch land. My eyes light up with heart eyeballs when they have dreams to host their private estate wedding. I keep two major things in mind when hosting a wedding at your home: (1) To disturb the property owner as least as possible and (2) to care for the grounds as if it were my own and leave it the way we were given the space. We never want to take advantage of someone's hospitality. I’m going to walk you through my process for planning and producing events in non-traditional wedding venues like a private estate or in a backyard for example. We’re going to put the wedding planning aside for now and discuss the 4 things to look out for when hosting your event at a unique location. Forewarning, planning a private estate wedding is not easier and contrary to popular belief about it being cheaper, it’s not. But you get the amazing benefit of flexibility and freedom to make it all flow as you would like. 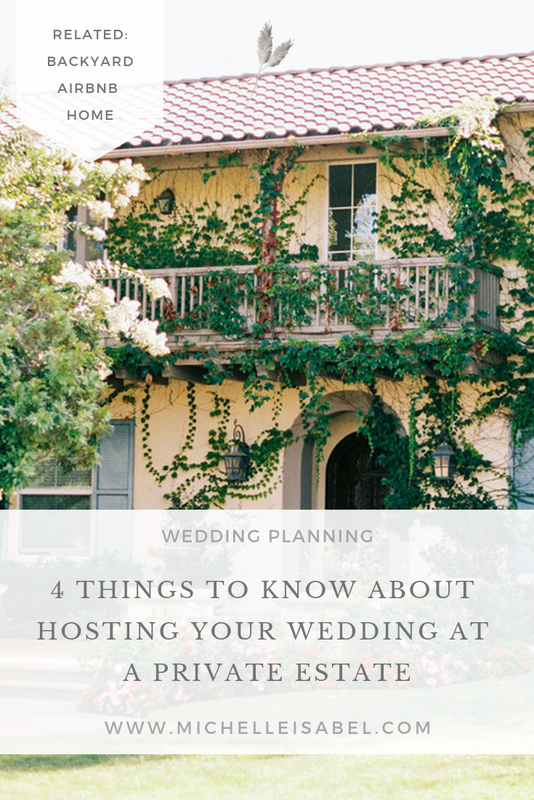 A lot of my clients want a private estate so they can host a weekend full of festivities like hosting a welcome party, their rehearsal dinner, the wedding and a farewell brunch. What I’m going to discuss is how to get your private estate wedding ready for these festivities, so you can have a smooth planning process once you start the normal wedding planning process. I’ve planned multiple events on private estates or at my clients’ home because they all wish to have their wedding outdoors in a private location. I’ve found that it’s not easier to plan a private estate wedding, as a matter of fact it’s more complicated and the challenges that you run into are hefty, like acquiring city permits, dealing with the fire department, installing additional lighting, figuring out parking, all of which are normally things that a venue already has in place. But private estates are much more flexible in terms of helping you create the wedding that you envision down to the very last detail. No cookie cutter weddings here that look like the one before it. It’s truly a special event and everything from the moment your guests arrive to the moment they leave is an experience in of it’s own and most likely one they’ll never experience again. The first thing I investigate is the power capability. The amount of power required to host a 20-person dinner party is vastly different from hosting 50 to 200 people. Keep in mind that you might be bringing in a live band, a DJ (a typical setup requires a standard 15 amp wall outlet), you might need to build out a kitchen or bring in portable restrooms (the nice ones). These among other things are going to collectively require large amounts of electricity and the last thing you want to do is blow a fuse- this could affect everything from food quality (as in if the fridge stops working the poultry can spoil fast especially on a hot day. The caterers will refuse to serve it because they could get a lot of people sick, which can lead to a lawsuit) to lighting (we do not want people walking around in the dark in heels at an outdoor space especially if the ground is not level). A great way to make sure you have the correct power is to assemble your team and have them each check to make sure they have what they need to run their equipment. If you find yourself in a position where you do not have the power you need, you can rent a generator. This is a BIG one you guys. I once had a couple where I was planning their private estate wedding (the groom’s childhood vacation home) in the woods so it was pitch black and the septic system was less than stellar. While the property had 3 restrooms on site the home was older and, again because it was in the middle of the woods high up on a mountain top, they didn’t have those new build restrooms we’ve all come to know and appreciate. We had to bring in portable restrooms and I’m so glad we did because the rehearsal dinner was at the home the day prior to the wedding and one of the restrooms ended up going out of service. And we had plans to host 200 people the following day. So if that happened for 30 people I didn’t even want to imagine what could happen on the actual wedding day. It’s essential to not rely on the home system to get your guests through an event. You need plug proof toilets, which is what the nicer porta-potties are for. In-home restrooms aren’t meant to be used and flushed by 200 people every few minutes. Plus it’s not friendly to the environment so better let someone else handle it. Pro-tip: If you can have the porta potty company deliver the night before, I highly recommend this especially if the road to your wedding destination is windy or up in the mountains. One of the first delivery trucks that planned to provide the porta potty broke down due to the steepness of the mountain so we had to reorder and they were delivered the day of the wedding just in the nick of time. Okay, this is another big one because the last thing you want to do is have your wedding end up on the news for the wrong reasons like this one. It’s important to hire a caterer that is familiar in working in outdoor spaces and most importantly that they are familiar in working on properties not built to host events. They will know exactly what to look out for and identify whether a kitchen will need to built out or not. If the kitchen does need to be built out they will help with requesting the rentals they need to make it happen. I do this a lot with my clients and prefer to work with Made by Meg for these types of events. In our most recent event together we were able to use the owners kitchen but it was a 6 million dollar home so we didn’t want the staff or the food production to damage their gorgeous kitchen. Made by Meg velon wrapped all the countertops and used special cleaning supplies to make sure they didn’t damage the kitchen materials. They brought in most of their own equipment to impact the owner as little as possible. During one of my planning meetings with them there was some discussion about bringing in a refrigerator and building out a scullery section so we wouldn’t be using the clients sink and space in the home to clean up and organize rentals. Lastly we need to look at the staffing. In a traditional venue space like a hotel or a venue like Calamigos Ranch in Malibu, you can expect to have staff present that direct guests on where to park or take out trash that is overflowing, you can count on facility staff to maintain sanitary restrooms. Staffing is critical in bringing your venue space full circle to function properly for your wedding. In a traditional venue there will be waiters and servers that are responsible for serving food, picking up drinks off the cocktail tables, they will clear plates from the guest tables to make room for dessert etc.. It’s important to hire staff and most importantly to have a staff captain that will know that the dinner fork goes on the left and knife on the right. They’ll need to know where to get ice for the water goblets, they’ll need to know how to fold napkins and set them correctly on the tables. There is a process to setting up a reception and that’s critical to creating a great experience for your guests. There are other factors to consider as you move through the process like putting together a rain plan, tent structures, bringing in lighting to light pathways in the evening, making sure you know where the sprinklers are so you don’t accidentally stake a hole in a pipe (that’s costly) and hiring an expert for lawn care.